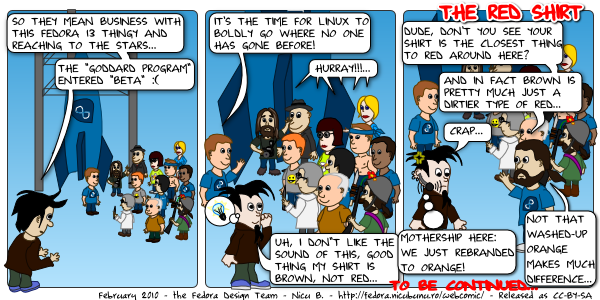 Those that followed my riddle know I had prepared in advance a comic for Fedora 13 Beta release, so later today is the Beta day and is the time for a webcomic special. There are ups and downs of having the content prepared in advance, the good part about it is that at times when your geek activity is unpredictable (duh! niche not covered in the study) you have at least something to put out. On the other hand, if the content was made too much on advance, it may become obsolete, and let me know what happened here: I am pretty sure someone from the Ubuntu camp decyphered my riddle and that was all the reason of their rebranding from brown to orange, to escape my joke. Well, it looks like I still had the last word with the ability to alter the final punchline! Do not forget the third part, "is about jumping to light-speed"! Is up and with an URL ready to be guessed. The truth is Ubuntu left Fedora in a could of dust years ago. All these cartoons that want to be funny manage to further throw Fedora in the pathetic light it's already swimming in... Sad.